Danish teak lounge armchair and footstool/ottoman, circa mid-1950s. Designed by Ejner Larsen and Aksel Bender Madsen and made by Ludvig Pontoppidan. Note: each chair and ottoman set is priced separately (i.e., two sets available, each set consisting of one chair and one ottoman). Chair measures 25.75" wide, 24.75" deep, 31" high, with approximate seat height of 16.5". Foot stools measure 23" wide x 15.5" deep, x 15.75" high at the sides, with approximate "footrest" height of 15". Both sets in very good vintage condition. Original upholstery with some scattered nicks as is typical of chairs of this age. 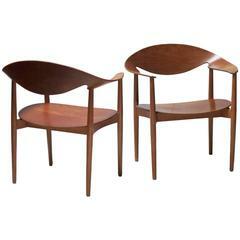 Pair of Danish lounge chairs with sculptural arms designed by Ib Kofod-Larsen for Selig, circa 1960s. Pair of open-arm lounge chairs by Baker Furniture in the style of a George III Gainsborough chair (also known as a Martha Washington chair). 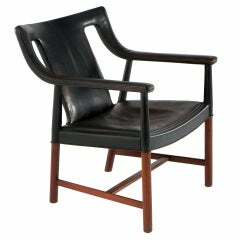 Rare LP48 armchair from 1948 by Ejner Larsen and Aksel Bender Madsen, made by Ludvig Pontoppidan in original black leather. Signed with label. Lounge armchair number LP48, and footstool, manufactured in 1948. 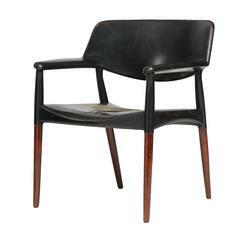 Designed by Ejner Larsen and Aksel Bender Madsen and made by Ludvig Pontoppidan in black leather. Signed with label. 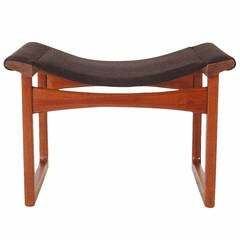 An elegant, graceful and finely proportioned arm chair having leather wrapped seat and arms, floating on solid teak dowel form legs. 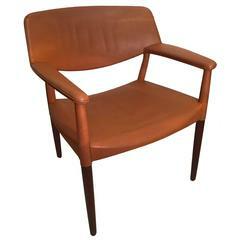 An outstanding armchair of solid wenge wood and original cognac leather designed by architects Ejner Larsen and Aksel Bender Madsen and produced in 1964 by cabinetmaker Willy Beck.